Susan Curtis was one of three buyers on the buyer’s mission for the SECO-funded Regional BioTrade Project Southeast Asia with Helvetas Swiss Intercooperation facilitated by ProFound. 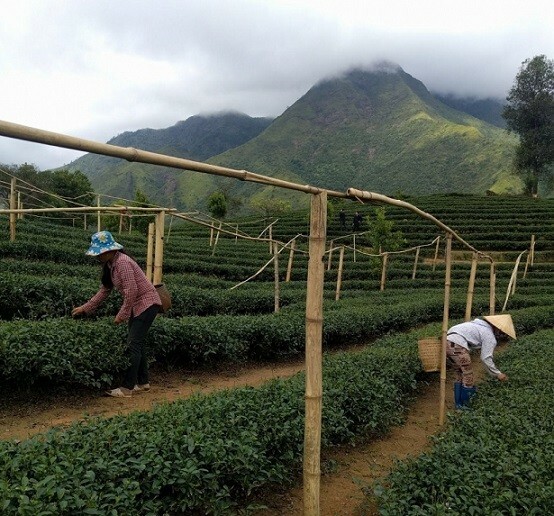 As Director of Natural Health at Neal’s Yard Remedies, Susan visited Myanmar and Vietnam and explored the possibilities to cooperate with suppliers of BioTrade ingredients. The mission inspired her to consider some of these ingredients for the products of Neal’s Yard Remedies, including both high quality spice essential oils and a cosmetic ingredient that would be new to Europe and has the potential to lead to some exciting and innovative new product development. A buyer’s mission is an important step in the match-making process between suppliers and buyers. ProFound’s consultant Robbie Hogervorst supported the buyer’s mission. He travelled to Myanmar, Vietnam and Laos together with Susan Curtis and two other buyers: Lutz Toennis from Cha Dô Teehandels GmbH (Germany) and David Doty from Mountain Rose Herbs (USA). The companies gave advice with regards to buyer requirements and discussed possibilities for collaboration with a selection of BioTrade suppliers. Do you want to know more about our work in Southeast Asia regarding BioTrade and match-making? Contact Robbie Hogervorst at rhogervorst@thisisprofound.com.